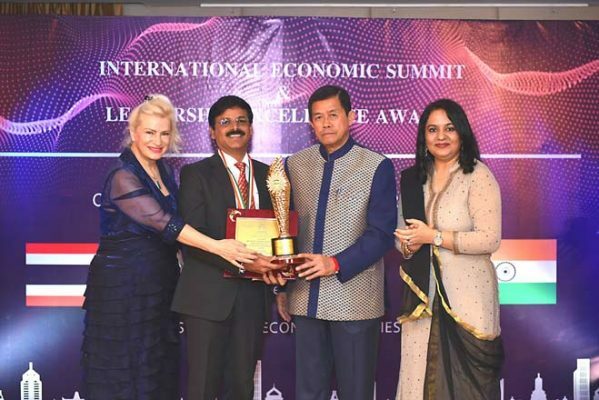 L&TMRHL Managing Director and CEO KVB Reddy have been conferred with the ‘International Leadership Innovation Excellence Award’ by the Institute of Economic Studies (IES) at the International Economic Summit held recently in Bangkok, Thailand. Hydrerabad, Metro Rail News: L&T Metro Rail Hyderabad Limited (L&TMRHL) Managing Director and CEO KVB Reddy has been conferred with the ‘International Leadership Innovation Excellence Award’ by the Institute of Economic Studies (IES) at the International Economic Summit held recently in Bangkok, Thailand. L&T Metro Rail Hyderabad Limited (L&TMRHL) has also been conferred with a gold medal for enhancing the image of India globally, according to a press release issued here on Thursday. Reddy received the award from Korn Dabbaransi, former Deputy Prime Minister of Thailand and Princess Isabelle Lafforgue of Mindanao. The IES was established in 1980 by a group of economists, parliamentarians and industrialists who came together to study and discuss problems concerning various aspects of the economy and economic development and offer their expert advice and services. Reddy said the award represents the success of Hyderabad Metro Rail and the gold medal commemorates HMR’s exemplary service and its first anniversary.